Off to Italy–with a good book! 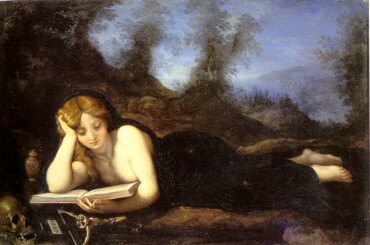 Maddalena leggente by Allori (1535-1607) public domain image from Wikimedia Commons. I’m sharing this link to the Sons of Italy blog today because I love their advice: Read a novel about Italy as part of your travel preparations!! And if you aren’t planning a trip to Italy, a novel can transport you there for a few hours. They have some great suggestions, some I’m adding to my own “to be read” list. Can you add something you’ve read to their list? Please comment! This entry was posted in Books and tagged reading, travel books. Bookmark the permalink. Read A Kiss From Maddalena by Christopher Castellani. I loved it! I’ll look for that one.